It’s important for you to choose a high or premium quality material as it will help in the storage of oil. A good material will ensure that the liquid won't get contaminated while it is inside the bottle. So, make sure that you choose glass or ceramic that is of food-grade quality with a tint shade, if possible, to give the oil the maximum protection that it requires. Based on your usage and storage needs, always choose the dispenser that can store the amount of oil that you require. Decorative olive oil dispensers come in different variants from 250 ml to 1000 ml. If you are planning to purchase a decorative dispenser to place on a dining table, then you can opt for a smaller one. Smaller dispensers are easy to refill and they're more mobile. Given their overall design and main component, decorative olive oil dispensers are more prone to leakage and breaking. So, make sure that you choose the product that is durable if you are planning to use it long-term. Most people are looking into getting a dispenser for olive oil as it ensures that the process of pouring the liquid is easy and as mess-free as possible. If you are one of these people, then you require a spout. A dispenser that doesn't have one is just a standard bottle. A good spout seals tightly with a flip top that will prevent spills. 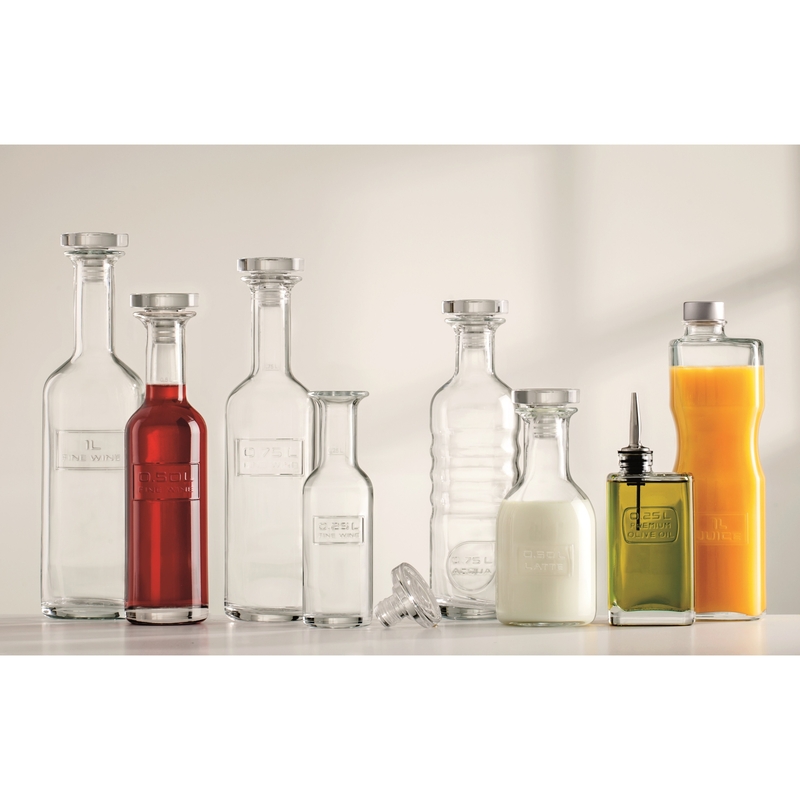 Now that you know how to choose a good decorative bottle for olive oil storage, check out our top picks below! The first decorative olive oil bottle on our list is lead-free, eco-friendly, and dishwasher-safe from Luigi Bormioli. It's capable of holding up to 0.25 L of liquid. This decorative glass bottle combines texture and height so you can just leave your olive oil bottle on your counter instead of tucking it in a cabinet. This olive oil bottle made of porcelain comes complete with a cork topper and a gift box. It won't just make for an excellent container for olive oil, but a storage bottle for your homemade sauce or favorite salad dressing as well. Since this 24 oz. bottle has a cork top, it will give your container for oils and sauces a unique look. Use this beautiful Lastra Olive Oil Bottle from VIETRI as a standalone counter decoration. Fill it with your favorite olive oil to give the product a different feel. If you are thinking of giving this as a gift for a loved one, you'll never go wrong with this because simplicity is, after all, always the best choice. This 3-piece oil bottle set comes with its own pourers and metal rack, which holds the 16 oz.-bottles firmly in place. With its thick, high-quality, and vintage-style Italian glass, this set of olive oil bottles can be left on any surface without worrying about breakage from constant sun exposure. If you're after a decorative olive oil bottle that is sure to impress, then this is the one for you. It's a durable oil bottle with a plastic cap to keep any liquid stored in it fresh. It has a Vintage Greek key styling at the top for a dressed-up look. Give this to a family member and watch his/her delight! You can also use it yourself, and you will find yourself smiling every single time you pick the bottle up. This set of milk-glazed decanters with olive leaf detailing is perfect for olive oil and apple cider vinegar. The bottles are capable of impressing your guests especially if you add a set at each table during your event. The unique design of the decanters sets them apart from other products. You'll be happy to know these bottles come with their own cork tops. Simple and sleek, it's a glass oil and vinegar cruet set that will look stunning as it rests on your dining room table or kitchen counter. We love that it has its own rack as well as a pourer that allows for an easy, elegant pour of liquid. Yes, you can finally say goodbye to spills! This set comes with milk-glazed terracotta dipping cups and a decanter. It has olive leaf detailing and an embossed "olio." You'll find this set irresistible as it is perfectly dainty! The combination of this set's beautiful material and gentle shape allows you to incorporate stunning little details into your kitchen. With its typographic details, handmade appearance, and olive-inspired motif, you can use this charming and decorative oil bottle to store liquid or showcase dried flower bouquets. Yes, it is that versatile! Overall, the glass bottle measures 13.38 x 2.24 x 2.24 inches. It is best displayed in kitchens with a simple silhouette. Conforming to a classic, time-tested design, this stunning oil bottle is good-looking and extremely effective at the same time. It is 100% lead-free and made out of stoneware with a novelty shape. Because it comes with a pourer, you can pour oil easily and without any incident. What's more, if you are done using it, you can keep the stored liquid fresh as the unit comes with a cover.